At the interface between the entropic size exclusion separation and the enthalpydominated liquid adsorption chromatography it is possible, experimentally, to identify conditions where polymer samples elute independent of their molar mass. These “critical conditions” function according to theory by compensating the entropy and enthalpy of the separation. For a series of common and specialty polymers, the mobile phase compositions and temperature which provide the molar mass independent elution behavior, for a given stationary phase, have been extracted from literature and summarized herein. 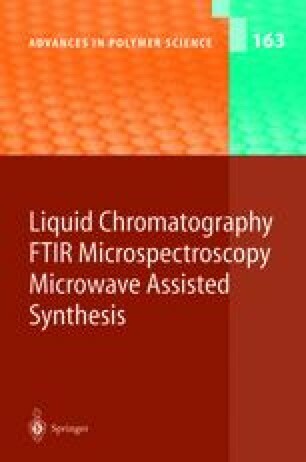 This collection may help to select, or forecast, suitable LC systems, when an application of liquid chromatography under critical conditions for a polymer is required. Correlations between properties of solvents, sorbents and polymers, such as solubility parameters, eluotropic strength and Mark-Houwink constants have been extracted from the collected data. Specifically, solubity parameters of critical mobile phases corresponding to a pair polymer-sorbent are in a majority of cases very similar. The elution strength of the first component of a critical binary eluent correlates linearly with the volume percent of the second component, especially, when an identical silica gel is applied. However, the critical conditions are independent of the thermodynamic quality of the solvent. Under limiting conditions, the mobile phase may be even a precipitant or a strong adsorption promoting liquid for an injected polymer. Possibilities for increase of the upper molar mass separation limit are outlined and influence of sample solvent on elution behavior is described. Applications of liquid chromatography under conditions of enthalpy-entropy compensation for separation of homo- and copolymers are also, briefly, summarized.